Ray Sybert (Casey Affleck) and Tchuda Southerland (Josh Stewart) struggle to keep their ship, the SS Pendleton, from sinking in Disney's THE FINEST HOURS, the heroic action-thriller presented in Digital 3D (TM) and IMAX (c) 3D based on the extrordinary tur story of the most daring rescue mission in the history of the Coast Guard. Chris Pine‘s “The Finest Hours” suffered a choppy start with $375,000 in its Thursday-night previews. The adventure-disaster film had a $70 million budget and is looking to make less than $10 million during its opening weekend. It is set to play in 3,143 locations. 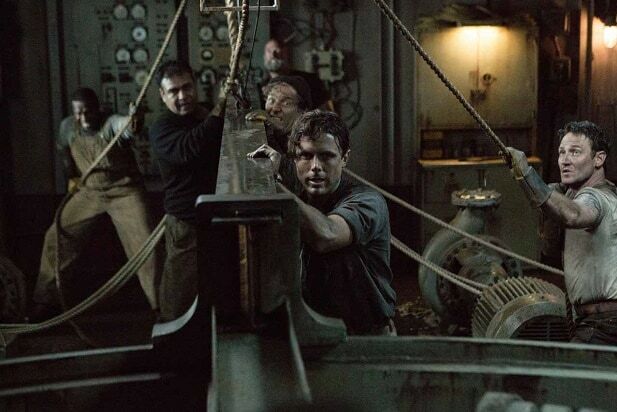 “The Finest Hours” stars Chris Pine and Casey Affleck and is directed by Craig Gillespie. It recounts the real-life story of the Coast Guard trying to save the crew of two oil tankers off Cape Cod in 1952. Ben Foster, Holliday Grainger, John Ortiz and Eric Bana costar. The third installment in the “Kung Fu Panda” franchise is opening this weekend as well, and it is tracking to earn somewhere between $45 million and $60 million for DreamWorks. The first “Kung Fu Panda” film had an opening weekend of $60 million, while the second grossed $47.6 million. Jennifer Yuh Nelson and Alessandro Carloni’s “Kung Fu Panda 3,” featuring the voices of Jack Black, Angelina Jolie, Dustin Hoffman, Jackie Chan, Seth Rogen and Lucy Liu, had a $140 million budget. It currently holds a score of 78 percent fresh on Rotten Tomatoes. “Kung Fu Panda” in 2008 had an 87 percent rating, while the sequel scored 81 percent in 2011. Set to open in 3,955 theaters, the animated film didn’t have any Thursday previews. Marlon Wayans‘ parody film “Fifty Shades of Black” is also opening this weekend, and it started with $275,000 in Thursday-night previews. Wayans produced, wrote and stars in the film, while Kali Hawk, Fred Willard, Mike Epps and Jane Seymour costar. It is projected to gross $10 million this weekend from 2,075 theaters, based on a budget of $5 million. The film parodies Dakota Johnson and Jamie Dornan‘s “Fifty Shades of Grey,” but in the spoof, an inexperienced college student named Hannah meets a wealthy businessman with different sexual practices. The film has a zero-percent fresh rating on Rotten Tomatoes so far, based on six reviews. A fourth film opening this weekend is Gavin O’Connor‘s “Jane Got a Gun.” The $25 million film is only opening in 1,210 theaters and didn’t have any Thursday previews. “Jane” was one of several films mired in Relativity Media’s chapter 11 bankruptcy filing. The Weinstein Company picked it up from Ryan Kavanaugh‘s studio. Natalie Portman and Ewan McGregor co-star in “Jane Got a Gun” alongside Noah Emmerich, Joel Edgerton and Rodrigo Santoro. O’Connor stepped in at the last minute to replace original director Lynne Ramsay, so the film’s troubles hardly started with Relativity’s bankruptcy.